Darryl Daniels is the 28th sheriff of Clay County. He and his administration are focusing on two main initiatives – crime reduction and community engagement. He has introduced enhanced strategies to reduce crime and engage the community to ensure residents have an effective and efficient law enforcement agency. Sheriff Daniels has a stellar 27-year career in law enforcement. He advanced through the ranks from officer, sergeant, lieutenant, assistant chief, division chief and now, sheriff. He was born in Miami, Florida. After graduating from high school, he enlisted in the U.S. Navy where he was stationed at Naval Air Station Cecil Field in Jacksonville, Florida and later deployed aboard the Aircraft Carrier USS Forrestal. He began his law enforcement career with the Jacksonville Sheriff’s Office (JSO). Sheriff Daniels has experience in patrol, internal affairs, traffic, accreditation and staff inspections. He was also a Community Problem Response Team member where he and his team addressed a variety of criminal activity. A dynamic leader in the community and in the workplace, Sheriff Daniels has commanded areas such as Crime Analysis, Information Systems Management, Grants, Training Academy, Emergency Preparedness, Community Service Officer and Reserve Programs, Auto Burglary Taskforce, Jails Division, Professional Standards Division, Continuous Improvement Division and the Health Services Division. He has been nominated several times as Police Officer of the Month and selected as Supervisor of the Month and Supervisor of the Year. He also served as a team leader and assessor for the Commission on Accreditation for Law Enforcement Agencies, Inc. (CALEA). He currently serves as the Vice Chair on the Commission for Florida Law Enforcement Accreditation, Inc. (CFA), co-chair of the Regional Domestic Security Task Force (RDSTF) Region 3, and a Domestic Security Oversight Committee member. The sheriff continuously furthers his knowledge in the law enforcement field. He attended the 255th session of the FBI National Academy where he was selected as section leader and he was the first to command two JSO divisions simultaneously. The sheriff attended the Law Enforcement Executive Development Seminar 76th session and the National Sheriff’s Institute 113th session. Sheriff Daniels is also a member of the National Sheriff’s Association. He serves as a member on the Drug Enforcement committee as well as a member of the Youth Offender/Juvenile Programs committee. 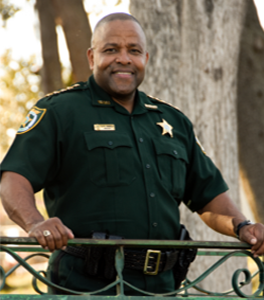 Sheriff Daniels holds bachelor’s degrees in criminal justice administration and multi-disciplinary studies as well as a master’s degree in religion. He has received several distinguished recognitions for his accomplishments in law enforcement and for his involvement in the community. Sheriff Daniels also sits on various boards and strives to keep the profession of law enforcement in Florida on the cutting edge.